Living the vegan life in Vegas! Obsessed with my next meal and the thigh gap. Get it on! Hey party people, long time no post! Sorry about that! Waiter: I know there are a few vegans in the group so first let me ask – what level of vegan are you? I mean, do you eat any meat? Me: No, vegans don’t eat meat, dairy or animal products. Waiter: Ok then, so what about fish? Waiter: Ok then, for dinner I would suggest the penne pasta that we can do for you in a delicious cream sauce! Me: That probably isn’t going to work because of the dairy…Can you do a tomato sauce? Waiter: Oh sure, I’ll put that right in for you! Me: Does the pasta contain egg? Waiter: Of course it does! Me: I’ll just have wine. I’m not going to name the restaurant and put the guy on blast because he really meant well and was more than happy to modify our orders however we wanted. But I will say that being in a food industry, I feel waiters should know their way around certain diets just because of food allergies and how dangerous they can be. Dinner ended up being fine – we ate salad, baked potatoes and strawberries in some insane balsamic reduction sauce for dessert. Basically since that night, my coworkers haven’t stopped asking me what level of vegan I am! Hard to say – sometimes I feel like a 4, sometimes a 9!? 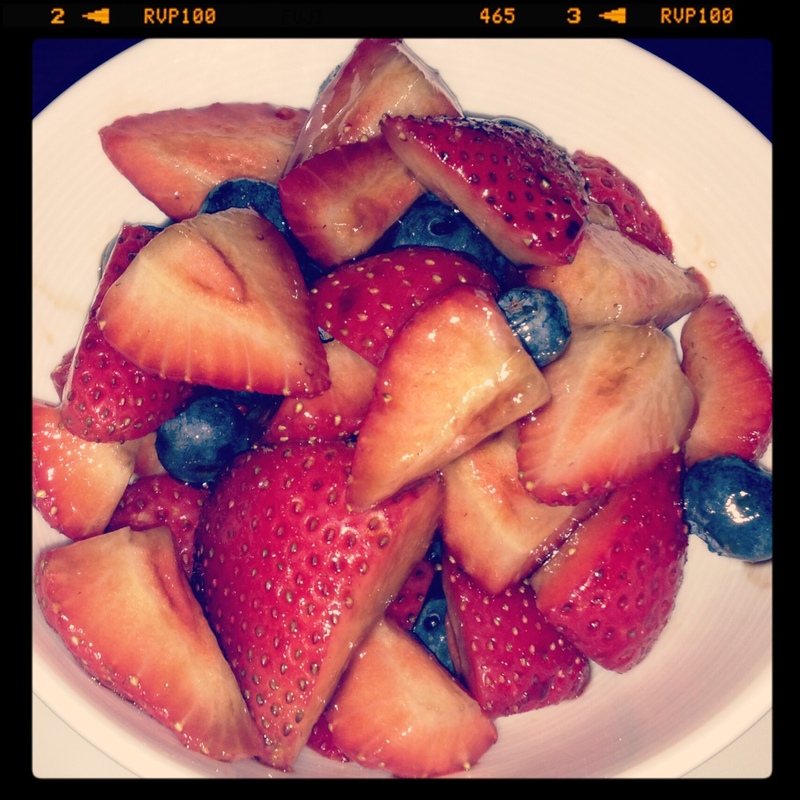 Here’s those strawberries – holy crap they were good! I get asked all the time what food I miss the most, now that I’m vegan, and it’s probably super annoying that I have no answer. There are so many substitutions and vegan alternatives out there, you can still have anything you feel like having (I love technology!) Can’t say that vegan donuts, cookies and pizza won’t make you fat, they for sure will. But at least no animals will be harmed on your quest to become a rolly polly – now, go out there and be somebody! On a more serious note, I would love to know your guys’ favorite non-vegan foods/meals that you’re dying to see a vegan version of! And don’t say like octopus because…really? These enchiladas were a special request that I guarantee no one would ever guess are missing meat and cheese – enjoy! Preheat your oven to 350*. In a large saucepan add your chopped onions and peppers and cook for 5 minutes, or until the onions become translucent. Then add the chopped mushrooms, cumin, red pepper (optional) and salt & pepper, mix and continue to cook for about another 5 minutes, or until everything is cooked thoroughly. In a separate saucepan, heat up your vegan ground beef and add additional seasoning if desired (I added some more cumin and salt to mine). In a large mixing bowl, add the tub of vegan cream cheese and 3/4 cup of the shredded vegan cheese. Add the cooked vegetable mixture, heated vegan ground beef and green onions and stir to combine. The heat of the veggies and vegan beef will melt the cheese so everything can mix together. At this point give it a taste and make sure it’s delicious. Adjust seasonings as desired. Pour some of the enchilada sauce into a baking dish and spread it around to coat the bottom and sides so the tortillas won’t stick. Place your tortillas between 2 damp paper towels and microwave them for 30 seconds. This will prevent them from cracking when you roll them up. If you’re using brown rice tortillas, I recommend microwaving them one at a time to get them extra soft. Pour some of the enchilada sauce on a plate. Coat one side of the tortilla, spoon some filling onto the dry side of the tortilla, roll up tightly with the wet side facing out and place into the baking dish, seem side down. Repeat step 7 until all your tortillas are filled, wrapped and in the baking dish. Side note – chances are you’ll have leftover filling after this step. I recommend chopping up the remaining bell peppers, some cucumbers or chips and serving it as a dip – also delicious! Pour the rest of the enchilada sauce over the top of the tortillas so everything is covered. 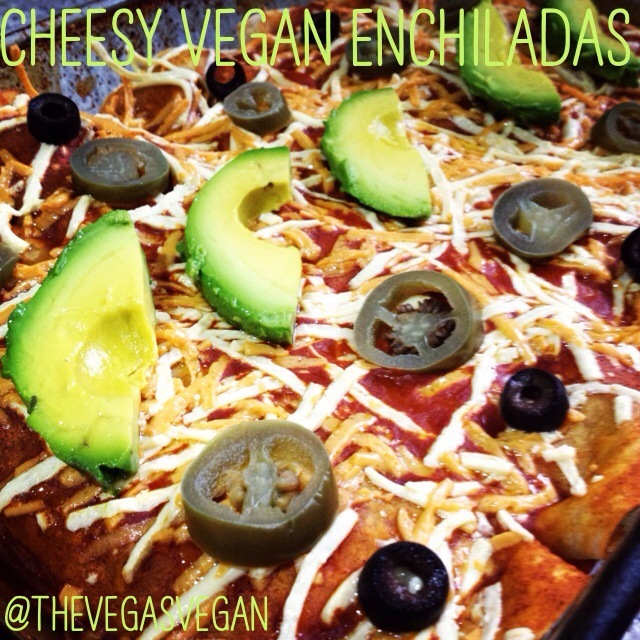 Sprinkle the remaining 3/4 cup of shredded vegan cheese over the top of the enchiladas. Heat in the oven for 10-15 minutes or until cheese is thoroughly melted. Before serving, top with avocado, jalapeños and olives. SOUNDS DELISH! BUT I WOULD HAVE TO COOK! WHAT DO YOU WANT FOR A BRIBE?